Irina Guseva of The Real Story Group had me thinking last week about complexity and Web Content Management. Somehow the lead value proposition of most WCM pitches is never quite achieved. Everyone should easily be able to do whatever they want with no training and still have meaningful content on the web right? What we really want I think can be illustrated by the technique of French painter George Seurat. The master of pointillism was one of the earliest experimenters with using tiny dots of single color on canvas to produce vivid images. 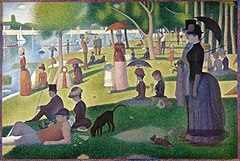 When we look at this image we seldom consider that the 2 by 3 meter canvas of the masterpiece A Sunday on La Grande Jatte took two years to produce. The single points of paint are only distinguishable when viewed up close or under magnification. These days we take for granted the concepts of screen resolution and pixelation but this artwork was truly groundbreaking and taught us so much about how the brain interprets what it sees. It strikes me that the difficult simplicity Irina talks about in her piece is so much like this painting. Each dot a discreet piece of content adding color in its own way to the image of the site as a whole. What we envision is each author with his own brush painting his own dots but this simple idea viewed from a distance is mind numbingly difficult to coordinate. The need for the artist – the one with the vision for the image as a whole can never go away. There must be a theme, a purpose or subject for the picture that is the site. And the individual contributors as important as they are remain constrained to a few colors. It is possible to create beautiful works of art this way. But without the right technology it is painstakingly difficult and time consuming. High definition televisions today painting 1024 dots per inch of just three colors proves how much can be done with simple things delivered at the speed of light. It remains however a problem with scale and human beings. Authors will never be happy being reduced to the editorial equivalent of three colors making WCM less a canvas and more a dance of compromise between creativity and constraint.